The 5s: We could never answer all of their questions, nor would we want to. The 5s yearn to understand how the world works. They have so many questions and we provide the tools to discover their own answers. Whether our children are recording their observations in logs or reaching out to primary sources, our 5s understand that research is a powerful tool for their learning and the backbone of a City and Country education. 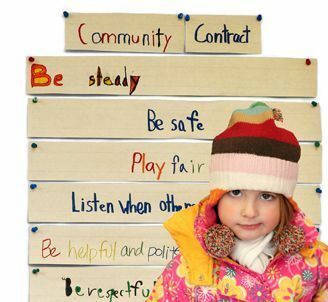 The 5s program strives to help children to develop a sense of growing independence as well as a sense of community. Children are expected to work on developing constructive ways to express their emotions, ideas and observations as individuals and as members of a group. The 5s program fosters independence in many ways; for example, children are encouraged to handle their own dressing needs, care for their own possessions and materials and negotiate their own social interactions productively. We also expect 5s to internalize the daily schedule and begin to develop skills to adapt to changes that occur in routines. Over the course of the year, children learn to work with a block partner for a week's time, taking turns with materials and interacting purposefully and respectfully. For 5s, social studies involves developing an understanding of themselves and the world around them. Work with blocks is the foundation of the 5s social studies program. During the course of the school year, the 5s’ ability to plan and organize their work as a group increases. The Group meets regularly to share and discuss issues that arise during block work. We expect each 5 to commit to a single, reality-based building idea each week, and to work productively with a block partner. To augment their current store of knowledge, we encourage 5s to conduct research through trips, use of the Library, books and inquiry. Working on buildings that represent services, stores and families encourages the interaction of dramatic play in which children use and explore their knowledge of the world. These interactions among 5s contribute to experiencing a sense of community. Woodworking takes on a new level of sophistication in the 5s. Early experiments with sawing and attaching pieces of wood with nails yield to carefully planned projects. Children learn to use safely the basic tools—saw, sandpaper, hammer and nails—and they sometimes use special tools such as the coping saw. They often measure one piece of wood with another to ensure accuracy for the final project. Early projects often include the simple “cross” airplane. 5s will go on to construct more complex items for use with the blocks—trucks, boats, trailers, trains, furniture. They might visit the Shop to procure special items such as hooks to attach trailers, leather for hinges, dowels for smokestacks, etc. After a careful sanding to smooth the edges of their work, 5s usually finish each project with a coat of paint. Paint, Clay and Paper: Painting provides an opportunity for children to express themselves individually. 5s explore the variety of hues they can mix using the provided colors—red, yellow, blue, turquoise, black and white. They experiment with different brush strokes for applying paint to paper—thin, wide, straight, curvy, twisty, as well as dots and smudges. As 5s refine these skills, many begin to make conscious choices about how they will arrange the elements on the page. Some 5s may begin to paint imaginary and real images from their experience and paintings gradually become more representational. Their increasing attention span enables them to spend significant time on each painting. Throughout the 5s year, the children are increasingly able to verbally exchange ideas for paint-mixing formulas and painting techniques. Clay is a tactile experience for 5s. They use their hands to change the shape of the material from a ball—they pound it flat, roll it into "snakes," pull it into towers, shape it into cubes. With their fingers, hands and arms, 5s can create textures in the clay surface—smooth, rough, bumpy. Clay is also a focus for 5s’ dramatic play. Children can change the shape of the clay as rapidly as their ideas evolve. They might make caves, volcanoes, snakes, “hide-outs,” or pizzas to share with their friends. As they begin to make representational sculptures, 5s are taught techniques for attaching parts and other details securely. The 5s’ use of paper is multi-faceted. Working with paper can involve construction and collage (cutting, tracing, stapling, gluing, taping, tearing and folding) as well as drawing and writing. 5s begin to add more detail, representational images, and often print, to their work. Language arts experiences are woven throughout the 5s program over the course of the year. Children learn to use environmental print as a resource/model for writing signs for block buildings, making lists and creating their own story texts with words and drawn pictures. Because children’s skills develop at different rates, some children will work independently using sound spelling, others combine dictation to a teacher with some sound-spelled words. 5s are guided toward sound spelling over the course of the year to support independent work. A systematic study of the alphabet supports the children's understanding of letters and the sounds they make. Children are read to daily from picture books and, during rest, chapter books are read aloud. Exposure to poetry, fiction and non-fiction makes for a balanced and varied literacy experience. The development of literacy skills is supported in additional ways including language arts games, beginning reader books, creation of group books, and the children’s active participation in the creation and use of charts (for block work, recipes, jobs and the daily schedule). Children practice the recognition and formation of uppercase letters as well as the identification of initial consonant sounds and their corresponding letter. 5s practice their handwriting (uppercase letters and numerals) through the multi-sensory program, “Handwriting Without Tears.” Our goal is to provide this age group with a challenging, yet not intimidating foundation in literacy. Singing and making music are embraced at different times during the school day in the 5s program. Children routinely sing songs they remember from their history at C&C as well as enjoying new songs that connect specifically to the individual Group identity. Teachers also incorporate songs in languages other than English as a vehicle to celebrate how people communicate in different ways both in the C&C community, NYC and in the world. The 5s math program is a mixture of group work, hands-on activities, paper and pencil work and concept-building games. Teachers draw upon a variety of resources, such as teacher-made games and activities, as well as the TERC Math Program. Much of the math in the 5s is embedded in the children’s daily work. Therefore, the children are able to appreciate math as a natural and practical part of everyday life. The goal is for children to explore concrete materials to build their abstract thinking. This exploration in the 5s serves to build a foundation for later learning. In this way, the children can become confident, flexible math thinkers, rather than rote learners. The curriculum provides multiple opportunities for children to strengthen the skills of problem solving, number concept, counting, patterning, estimation, non-standard measurement, basic geometry, sorting and classifying, sequencing and data collection. Science experiences are woven throughout the 5s’ school day. Emphasis is put on making observations, predictions and connections about the environment and the natural world. Indoor and outdoor blocks also provide opportunities for the 5s to experience the concepts of balance and levers, as well as the use of pulleys. Scientific explorations that often occur in the 5s include seeds and planting, the change of seasons, and the life cycle and habitat of a living thing, for example, tadpoles or snails. These explorations are often initiated by the children and take shape as the children’s curiosity evolves. For example, finding seeds in the Yard naturally leads to seed and plant identification and attempts to sprout. This can also lead to learning about the growth cycle of plants as well as the weather conditions plants need to grow. Books, trips and visits with the Science teacher support the 5s’ scientific studies. 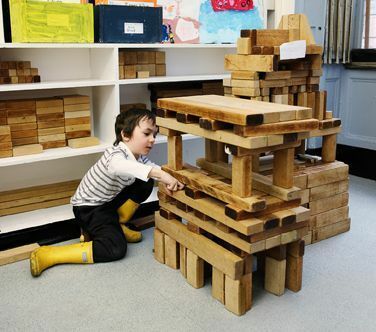 Unlike traditional outdoor play environments that have solely jungle gyms and climbers, children in City and Country’s Lower School work to build their own play structures. Building with the yard materials (large and small boxes, blocks, boards, ladders and sawhorses) develops strength, coordination and balance. Building also offers opportunities for physical and mental problem-solving. The Group’s work associated with building requires social negotiations, sharing of materials and dramatic play. The children work as a group to pick up and put away the yard materials at the end of each building day. Children also have the opportunity to hone additional physical skills on the climber and slide.